HolyJuan: Don't ask, no Wonkas! I did some work at the Columbus Zoo a few years ago. One of the components was a nocturnal building in the Australia area that the exhibits division at the zoo wanted turned into a themed bar/restaurant/travel office/educational center/insect diorama/casino. Another case of if simplicity is good, then a bunch of simple concepts thrown together should be GREAT! One unique aspect was the signage in the building. They wanted themed/aged humorous signs. As it turns out, humorous themed signs are my specialty. When we had the signs made, I had a second made for myself. I took it with me when I left the Studio. It’s hanging up at work. A small window that looks out at a more creative time. The Willie Wonka and the Chocolate aficionados will notice that there is a slight issue with the sign. Any guesses? If you get a chance to check out the Nocturnal Building (Or Bob and Evelyn's Roadhouse as it lovingly called)look for the huge relief map of Australia on the wall. That is constructed out of blood, sweat, tears and four, one gallon cans of Bondo. Look for the area on the map marked "Mystery Spot" and put your car keys near it. 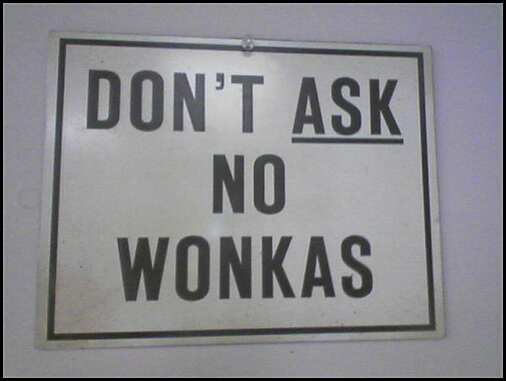 I would assume that when the sign says, "no Wonkas" it was really supposed to say, "No Umpa-Lumpas". All of "Don't Ask" should be underlined. Do I get a prize? "I was right and HolyJuan was wrong."